Puff pastry sheets are made up of laminated dough and butter packet. 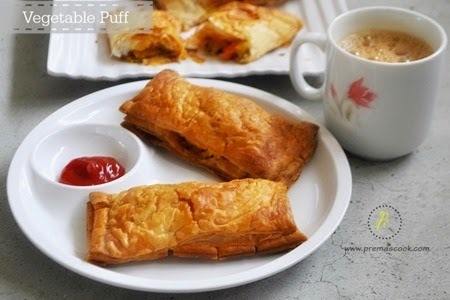 Puffs available in bakeries are very light, flaky, mechanically leavened pastry containing several layers of fats. 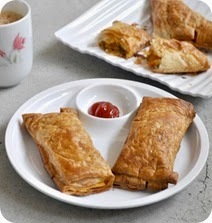 But if we make the puff pastries at home we can avoid more usage of fats and make healthy. I have planned to post home made puff pastry recipe first before posting the vegetable puff recipe but still the pastry sheet post was not ready so am posting the vegetable puffs recipe here and soon will post How to make puff pastry sheets at home. 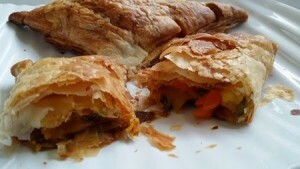 Vegetable Puffs are our most favorite snack that i make often at home but not now a days due to shortage of the pastry sheets at store near to my house.I then thought of making them at home and this is the first time ,some how i got the good result. Taste also same like store bought pastry sheets and happy that i have used very little fat for them. I have already posted some recipes using the pastry sheets like Cheesy mushroom puffs,Puff Pastry Soup,Fruits mince pies,Sweet Pastry pin wheels. Take the sheets of Puff Pastry out and thaw them at room temperature or follow the instruction of the pastry sheet back side cover(if you are using store bought sheets).Pre-heat the Oven. Lets make the stuffing, Boil Potato and make ready the vegies.Take a small skillet and heat Oil on medium heat. Once hot, add in the cumin seeds,Onions and saute till they turn translucent. Add in the Potatoes,other vegetables and a little salt. Mix well, cover and cook for 2-3 minutes till the Potatoes and vegetables are cooked.If you want to add the paneer add it at this stage. Now add in the spices like Coriander Powder, Turmeric Powder, Chaat Masala and Red Chili Powder. Mix well and keep aside. Cut the Pastry sheets strips into 3s to form a square.Put 1 tbsp (approx) of the stuffing. Fold the Pastry Sheet to make a triangle or to make rectangle. use fingers firmly, press into the sides and press away ( help seal). Put the Puffs on a foil or baking trays. Place in the pre-heated oven at for 15-30 minutes.Once they are out of the oven, transfer them to a cooling rack and allow them to rest and cool down for 5 minutes.Serve with chutney or ketchup. 1. Use any vegetable of your choice and spice combination for the Puffs.Paneer makes the puff very rice and tasty.Adding finely chopped green chillies or cilantro are optional . 2. It is very important to allow the stuffings to cool for 5 minutes and then use it . 3.Use up left-overs subzis, keema or just scramble some eggs according to wish to make it innovative! Enjoy the flaky Vegetable by adding your yummy and innovation stuffing. so crispy layers yummy prema.. I made puff pastry at home once…so much work 🙁 yours look better than the store bought ones. flaky and full of home made goodness.